Shopping online and being able to pick up your purchase at the store is a minor convenience, but you still have to drive to the store, wait to be served, get your package, and drive home — and you may have paid more than you would at Amazon or some other online-only retailer. 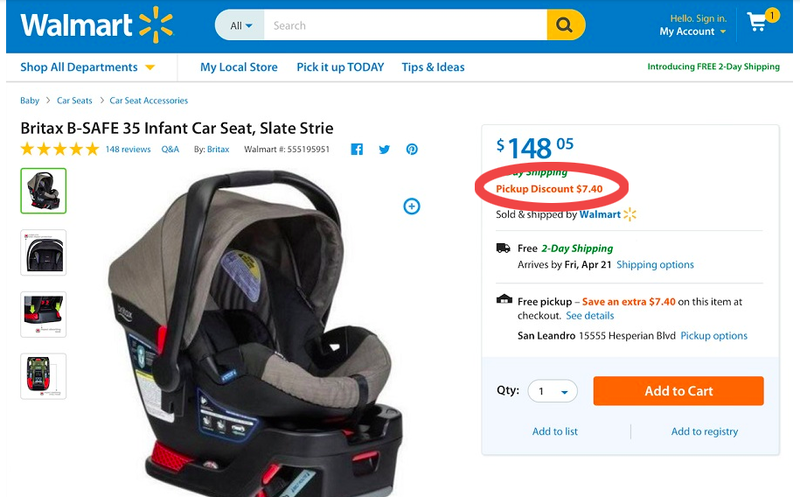 So to make this option more attractive to shoppers, Walmart.com will be discounting millions of items if you purchase them for in-store pickup. Walmart announced today that starting April 19 customers using “Pickup” will receive a discount on eligible, online-only items that are shipped to any Walmart for pick up. The discounts will initially appear on about 10,000 items and then roll out to more than one million products by the end of June. Items eligible for the discount will include a “Pickup Discount” notification on its product page on Walmart.com. The discounts range from just a few dollars to $50. For example, a LEGO City Great Vehicles Ferry comes with a discount of $2.55, a Britax B-SAFE 35 Infant Car Seat includes a $7.40 discount, while a VIZIO SmartCast M-Series 70” 4K Ultra HDTV has a discount of $50. Once products are added to a shopper’s cart, they select their closest eligible store and follow the typical checkout process. In order to ensure things move smoothly with Pickup, Walmart says it will add staff to the service. Walmart says that it’s able to offer the discounts by eliminating the “last mile delivery costs” by leveraging it own fleet of trucks that carry items directly from its own fulfillment centers to stores. The addition of Pickup discounts is just the latest Walmart program aimed at pulling online shoppers away from rival Amazon. Last month, the company began testing in-store screens that let shoppers buy things online if they couldn’t find them while inside the big box store. The retailer has also gobbled up a number of online retailers including Jet.com, shoe-tailer ShoeBuy, outdoor retailer Moosejaw, and indie clothing retailer ModCloth.